Introduction to the Historical Catechetical Method of Teaching the Faith. Before you begin. Read Luke 1:1-4, 2 Tim 2. 1. Why do we need a catechism? As a youth I listened to a popular (or should I say ‘populist’) preacher announce during a sermon, that his upbringing in the Christian Faith was of no real value to him. He claimed, pejoratively, that he had been ‘baptised, catechised and hypnotised.’ It was a good throwaway line, sure to get an audience reaction. He was making the point that until one becomes a believer, learning the basic elements of the Christian Faith won’t save. In that he was right, but it is irrelevant. Nothing can save but Christ, and Him Crucified. That doesn’t mean that we should reject every other aspect of Christian teaching and instruction. A grounding in the faith is vital for the new believer, and for young children to learn in early years what being a Christian is really all about is never a bad thing. Catechesis is a PROVEN method of instruction. It was the method of instruction used by the post-apostolic early church. It was the favoured method of the Reformers and the Puritans. A case-study to consider would be the ministry of Richard Baxter of Kidderminster. (1619-1651, Author of ‘The Reformed Pastor). Baxter came to a parish that was full of rowdy drunkenness and ungodliness, and where the parish mister was of little use in the gospel. Baxter was called by the church to give lectures. He did so, but also began a programme of personal catechesis, which was so successful that Kidderminster became one of the most Godly, sober towns in England. Catechesis is a PRACTICAL method of instruction. Anyone can read and profit from the Heidelberg catechism. One can read it alone, every day, making notes and following up the Bible references that are included. It can be taught as a study curriculum for a smaller group of Christians, meeting together for that purpose, and that can be discussed after the lesson, – the study leader correcting any misapprehensions that the students may have. It can be taught as part of our public worship in church, either as a form of guidance (like a lectionary) for the pastor’s sermon framework, or as separate part of the service. It can be taught on the internet! 2. How does the Heidelberg Catechism in particular meet that need? Why Heidelberg? There are many good catechisms in print, including the excellent ‘Shorter Catechism’ of the Westminster Divines. There are a number of very useful children’s catechisms. The Heidelberg Catechism is helpful for instructing adults because of it origins, its structure, its devotional character and its faithful placarding of the plain teaching of God’s word. 1. Its origins. It was in the 16th Century, that the Elector Frederick III of Palatinate decided that it would he good to have a book of basic instructions for the laity in his dukedom. The proposed catechism was put together at the university of Heidelberg, and credits the faculty there for its composition, but it was largely the work of Zacharius Ursinus and Caspar Olevianus. The catechism would combine the best of Lutheran and Reformed theology and would counter the teachings of the a Roman Catholic Church, by its constant references to scripture. 2. Its purpose. The basic underlying premise of the Catechism is that everyone needs COMFORT in life and in death. 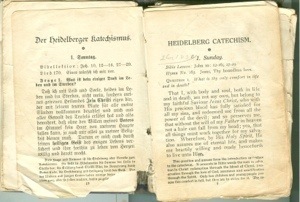 The Heidelberg Catechism is structured in three parts. There is an introduction, in which the purpose of the Catechism is explained, and the three part structure laid out. It follows the systematic structure of the book of Romans, showing the means by which a sinner may know Comfort and peace at the end of his life; by realising and confessing the depth of his sins, his own utter depravity and unworthiness before God, by looking to Christ, and seeing him as the only Saviour for sinners, in his perfect, sinless life, and atoning death on the Cross, and resurrection from the dead, and then finally, to be thankful for what Christ has done in saving us from sin, death and hell. The Catechism closes with a question and response on the word ‘amen’. Included for our learning are the Apostle’s Creed, the Lord’s Prayer and The Ten Commandments. Because the Catechism was intended for weekly instruction it is laid out in 52 ‘Lord’s Days’. * Its doctrine. The doctrine of the Heidelberg Catechism is the historic belief of the church, from apostolic days until now. It is the doctrine of the Reformers, and the Puritans. It is REFORMED in theology. We can read the Bible. Why do we need a catechism? What does the word ‘catechesis’ mean? List some examples of people who were catechised, or who used catechetical instruction in the New Testament. How does the Heidelberg Catechism address one of the most basic human needs? Describe the structure of the Heidelberg Catechism. In 2 Timothy 2, how was Timothy to pass on the Christian faith to other faithful men? What would have been his method of instruction? 5. Pray. Father, as I read your word and learn from it, and as I am taught the doctrines of the faith that have been the basis of Christian belief and practice throughout the ages, may I seek the comfort of the knowledge of sins forgiven, that only comes through knowing Christ, who died upon the cross for sinners. May I return to you my thanks and my praise, now and throughout eternity. Amen.